Good or bad, history always leaves its footprints as evidence of a certain event that occurred. 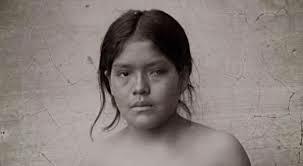 Damiana Kryygi was just a three-year-old girl when she survived the massacre of her Aché family back in 1896, the response of white settlers to avenge the stealing of their horse. Filmmaker Alejandro Fernandez Moujan traces down the events that happened over a century ago as a last farewell to a girl, whose life was interrupted short. Once the film begins, the narrator introduces us to Damiana Kryygi, who lived in the dense Paraguayan jungle. By looking at the photo of her, you won’t believe your ears after hearing what happened to her after surviving the brutal attack. The girl was held captive and became an object of scientific experiments which eventually took her precious life. One hundred years later Damiana’s people recover her remains from Argentina’s La Plata Museum and Berlin’s hospital. The fact you will be seeing in the film in the way the entire family was killed is something that you won’t see even in the most imaginative horror film. However, it’s the impact of her death and the massacre is what ultimately reunited the Aché people as a symbol of endless hope, unity and the struggle that they still can’t forget up until these days. “Damiana Kryygi” is a film that may touch and hurt you deeply if you’re a sensitive viewer. It’s not easy to go through each scene as you see or hear the details that made the Aché people to suffer for such a long time. It’s a film that’s not only worth seeing, but also gives you an information about the shocking brutality of the so called “white-people” who were willing to kill the entire tribe for stealing a horse. In conclusion, “Damiana Kryygi” conveys an important message to those who are not so willing to learn from the lesson of the past. It shows that the aftermath of killing in 1896 will never be forgotten while the time fails to ease the pain. A pain, that only Damiana Kryygi and her people were aware of.